For the most part, when Rebels brings a character back into the fold, they’ve been able to get the actual actor to lend their voice. For instance, James Earl Jones voiced Darth Vader, Frank Oz came back for another turn as Yoda, and Billy Dee Williams recently took Lando out for a spin. This hasn’t always been the case, however, as neither Ewan McGregor or Alec Guinness were available to reprise their roles. In the latter instance, this is because Guinness passed away in 2000. Death is also the reason Peter Cushing, who left us in 1994, will also not be back to voice Tarkin. It is admittedly a little weird to hear a different voice coming out of this character, though it is Stephen Stanton, who performed the character in The Clone Wars, so there’s a level of continuity going on here. The Governor of the Imperial Outland Regions, which just so happens to include the planet Lothal, where Rebels takes place, Tarkin was killed in A New Hope when Luke Skywalker blows the first Death Star out of the sky. But given the setting and time period, it stands to reason that he would make an appearance here. 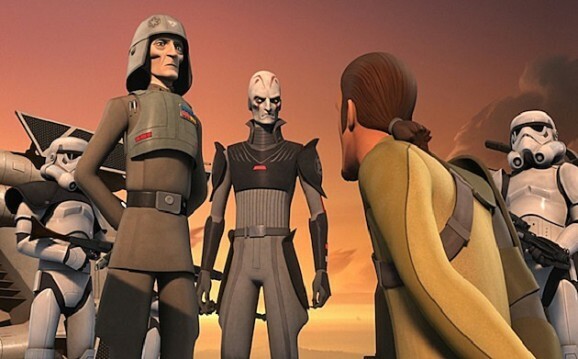 As you can see in this clip, Tarkin shows up on Lothal to inquire about why the local leadership has allowed the titular group of insurgents to not only gain a foothold, but to run rampant over their forces. According to EW, he also shows up to downplay the reports that any Jedi survived Order 66, which practically wiped them out of existence. You can bet he’ll have some things to say to The Inquisitor and Agent Kallus, who are both there when he arrives, behind closed doors. And as you can see in this photo from the episode, even if he doesn’t quite believe, he gets a firsthand encounter with Kanan, a Jedi who is still very much alive and kicking. “Call to Action” airs Monday on Disney XD.